Background: This case involves an 86-year old man who originally presented with a nodal recurrence from a left-sided oral tongue squamous cell carcinoma. Incidentally, he also had a synchronous epidermal inclusion cyst in the posterior neck. Treatment involved surgical removal of the recurrent cancer and the cyst followed by the delivery of 66 Gy of radiation to involved areas. Post-radiation therapy the patient reported a large oozing lesion on his posterior neck. After treatment with doxycycline and prednisone the lesion resolved. Main Observations: Visually the lesion resembled a dermal lymphatic malignant recurrence. Pathologic analysis of the lesion showed no malignancy but was representative of an inflamed epidermal inclusion cyst versus an acneiform eruption. Since the lesion resolved with doxycycline and prednisone, acneiform eruption was felt to be more likely. Conclusions: The authors hypothesize that this lesion occurred via a similar mechanism as radiation dermatitis. Importantly, the unique exaggerated presentation of this case suggests that radiation can trigger an inflammatory response in areas of pre-existent cystic rupture leading to an acneiform nodulocystic eruption that can mimic dermal lymphatic recurrence of carcinoma. Radiation acneiform eruption is a rarely reported sequela of radiation therapy that presents with inflamed and ruptured comedones and cysts in the area of radiation . We present a case of an exaggerated acneiform eruption occurring after radiation therapy to the neck that is more severe than has been described in the literature and was likely exacerbated by a preexisting partially removed epidermal inclusion cyst. An 86-year-old man with a remote smoking history and a history of T1 N0 left-sided oral tongue cancer status post resection four years prior, presented with a rapidly enlarging left neck mass and otalgia in June 2015. A CT of the neck showed multiple enlarged centrally necrotic lymph nodes deep to the sternocleidomastoid muscle involving the left cervical chain (Figure 1). There was also a hypodense round lesion extending from the skin surface into the subcutaneous tissue of the left posterior neck. Physical exam revealed a 6 centimeter (cm) left neck mass fixed to the sternocleidomastoid muscle. A 1 cm nodule was noted on the posterior aspect of the scar in the left lateral tongue. Biopsies of these two lesions both revealed squamous cell carcinoma. Also, a small left level 5 nodule was noted to be fixed to the dermis. Biopsy of this lesion was shown to be an epidermal inclusion cyst. Figure 1: A) Enlarged centrally necrotic lymph nodes biopsy proven for squamous cell carcinoma. B) Hypodense round lesion extending from the skin surface into the subcutaneous tissue of the left posterior neck as seen on initial staging CT neck. Biopsy revealed an epidermal inclusion cyst. This lesion was excised at surgery and was not detectable during the time of post-operative radiation therapy delivery. In June of 2015 he underwent a left radical neck dissection of levels IA through V, excisional biopsy of the left lateral tongue, and excisional biopsy of the skin of the left posterior neck. Pathology showed moderate squamous dysplasia in the tongue and a 6.3 cm deposit of moderately differentiated squamous cell carcinoma of the left neck involving the sternocleidomastoid muscle and a large vein with 7 of 33 lymph nodes positive. The posterior level V neck mass pathology revealed an epidermal inclusions cyst with rupture and no evidence of malignancy. Radiation therapy included delivery of 66 Gray (Gy) to areas with evidence of extracapsular extension, 60 Gy to the dissected neck and tongue, and 54 Gy to affected nodal areas, all delivered in 30 fractions. Given his age and multiple comorbidities, he did not receive concurrent chemotherapy. Treatment was completed in August 2015 and complicated by grade 2 mucositis and grade 1 dermatitis. 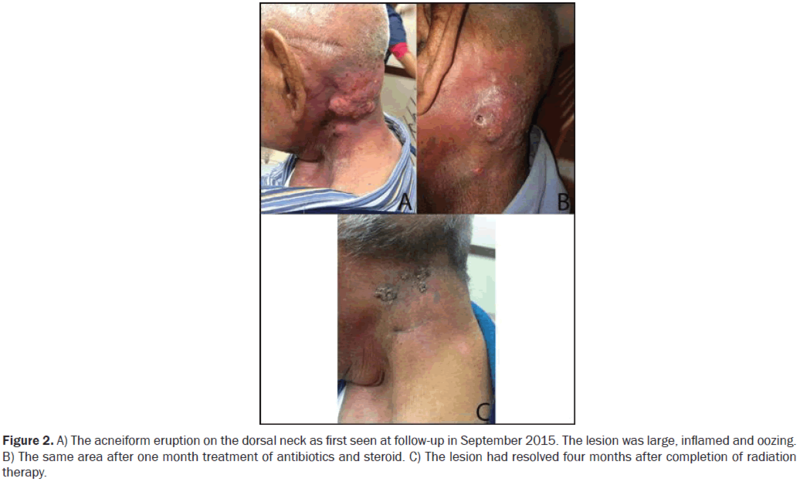 One-month post-radiation therapy the patient reported an oozing lesion on his posterior neck that had rapidly grown over four weeks (Figure 2). The exam revealed no palpable lymphadenopathy. Pathologic findings from biopsy were consistent with an inflamed and ruptured epidermal inclusion cyst or follicle versus post-radiation acneiform eruption with no evidence of malignancy (Figure 3). The area of the lesion was contoured on the radiation therapy planning CT scan to assess the dose received by this area (Figure 4). The area where the cyst occurred received a maximum of 66.57 Gy and mean of 34.19 Gy. He was treated with doxycycline and prednisone. One month later (two months post-radiation therapy) his lesion had decreased in size (Figure 2) and at four months had completely resolved (Figure 2). Ten months post RT, he had no evidence of cancer and no further dermatologic lesions. Figure 2: A) The acneiform eruption on the dorsal neck as first seen at follow-up in September 2015. The lesion was large, inflamed and oozing. B) The same area after one month treatment of antibiotics and steroid. C) The lesion had resolved four months after completion of radiation therapy. Figure 3: A) Low power (4X) H+E image from the neck dissection showing cohesive swaths of infiltrating squamous cell carcinoma with evident keratinization at the right aspect of the image. B) High power (20X) H+E image from the neck dissection showing tumor cells infiltrating fat. C) Low power (4X) H+E image from the patient’s concurrent posterior neck mass biopsy. The section shows benign-appearing skin surface with what appears to be a ruptured subepithelial cyst. D) High power (20X) H+E image from the posterior neck biopsy after radiation and subsequent eruption showing either an acneiform process or ruptured epidermal inclusions cyst lined by innocuous-appearing squamous cells with associated inflammation. Figure 4: Isodose lines of the treatment area to show the 95% dose coverage for PTV1, PTV2, and PTV3 which corresponds to 62.70 Gy (red), 57.00 Gy (blue) and 51.30 Gy (magenta). The area enclosed within the elliptical teal line represents the location where the cyst would form, and it received a maximum of 66.57 Gy and mean of 34.19 Gy. Upon presentation, the clinical appearance of this process most resembled a dermal lymphatic malignant recurrence or an inflammatory process or a combination of the two. Pathologic findings showed the absence of malignancy and the presence of an inflamed, cyst-like structure consistent with post-radiation acneiform eruption versus ruptured epidermal inclusion cyst. Acneiform eruption after the receipt of radiation therapy is thought to be related to a reduction of sebum produced or an alteration of its composition [1,2]. This is thought to lead to chronic follicular inflammation and hyperkeratosis with hyperproliferation ductal keratinocytes and keratin plugging . Usually, this results in the appearance comedones in the radiation field after a variable latency period of two weeks to six months . The eruption in our patient was more consistent with follicular cysts and pustules, which are also described in radiation-induced acneiform eruptions. This case represents an extreme example not seen in the literature previously. Epidermal inclusion cysts are common skin lesions often caused by a damaged or ruptured pilosebaceous unit as well as traumatically implanted surface epithelium into the deeper layers of the epidermis . These lesions are defined histologically as encapsulated cysts lined by stratified squamous epithelium with a core of keratin lamellae [3,4]. Epidermal inclusion cysts are usually benign; however, they can become inflamed or infected and in rare instances have contained malignancy [4-6]. There was no evidence of malignancy on pathology from biopsies of this area. Both acneiform eruptions and epidermal inclusion cysts can have a cyst-like architecture with inflammation. However, since the lesion responded to treatment with prednisone and doxycycline alone, post-radiation acneiform eruption was more likely . The reason for the exaggerated clinical presentation of this case is unknown. It is possible that the inflammatory response associated with pre-existent cystic rupture may have been potentiated by radiation leading to a severe, temporary nodulocystic eruption. Interestingly, the pathogenesis of this reaction is likely similar, though less common, to the process leading to common radiation dermatitis. Radiation dermatitis involves both an acute and a chronic phase . The acute phase is characterized by the formation of a “complex wound” . This occurs when the radiation given mediates damage to the tissues and cells of the skin leading to the release of several “danger signals” including free radicals, DNA damage, and the alteration of macromolecule structure [8-10]. Activation of various innate immune receptors then leads to the chronic phase including the transcription and release of pro-inflammatory cytokines and inflammatory mediators as well as increasing the recruitment of inflammatory cells [9-11]. With each fraction of radiation given, this process continues leading to cumulative recruitment of inflammatory cells, metalloproteases, and tissue damage [8,9]. In the case of this post-radiation acneiform eruption, we propose a similar process of radiation-induced tissue damage exacerbating a local inflammatory process. Damage to the cyst wall lining promoted release of pro-inflammatory contents and the spread of a sterile inflammatory process leading to the large and inflamed appearance of the eruption. This would explain the alterations in the production and content of sebum in the pilosebaceous unit, especially if this pilosebaceous unit was previously altered by the presence of an epidermal inclusion cyst. The result was a large, inflamed, and fluctuant lesion seen in this case. To the best of our knowledge, this is the first report of such an exaggerated presentation of post-radiation acneiform eruption in an area receiving radiation therapy and is suggestive of the ability of radiation to trigger inflammatory reactions in nearby susceptible lesions that can mimic dermal lymphatic skin recurrence. Turrion Merino L, et al. Localized acneiform eruption following radiotherapy in a patient with breast carcinoma. Dermatol Online J. 2014;20. Martin WMC and Bardsley AF. The comedo skin reaction to radiotherapy.Br J Radiol.2002;75:478-481. Lee H E, et al. Comparison of the surgical outcomes of punch incision and elliptical excision in treating epidermal inclusion cysts: A prospective, randomized study. Dermatol Surg. 2006;32:520-525. Swygert KE, et al. Melanoma in situ involving an epidermal inclusion (infundibular) cyst.Am J Dermatopathol. 2007;29:564-565. Mehrabi D, et al. Removal of keratinous and pilar cysts with the punch incision technique: Analysis of surgical outcomes. Dermatol Surg. 2002;28:673-677. Tokunaga M, et al. A case of an undifferentiated squamous cell carcinoma arising from an epidermal cyst. Case Rep Dermatol Med. 2013;2013:1-3. Parr K, et al. Resolution of radiation-induced acneform eruption following treatment with tretinoin and minocycline: A case report. Cutis. 2013;92:27-28. Singh M, et al. Radiodermatitis: A review of our current understanding. Am J Clin Dermatol. 2016;17:277-292. Hymes SR, et al. Radiation dermatitis: Clinical presentation, pathophysiology, and treatment 2006. J Am AcadDermatol. 2006;54:28-46. Ryan JL. Ionizing radiation: The good, the bad, and the ugly. J Invest Dermatol. 2012;132:985-993. Müller K and Meineke V. Radiation-induced alterations in cytokine production by skin cells. ExpHematol. 2007;35:96-104.